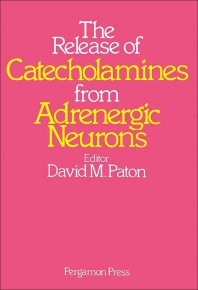 The Release of Catecholamines from Adrenergic Neurons covers the advances in understanding the mechanism of catecholamine release and other neurotransmitters from adrenergic neurons. This book is organized into four sections encompassing 18 chapters. The opening section surveys biochemical studies of the mechanism and regulation of nerve stimulation. This section examines the role of calcium, prostaglandins, and presynaptic adrenoceptors and muscarine receptors in catecholamine release. The next section describes the modification of catecholamine release by several drugs, including adrenergic neuron blocking agents, narcotic analgesics, opioid peptides, lysergic acid diethylamide, anesthetics, alcohols, and adenosine and adenine nucleotides. These topics are followed by discussions of catecholamine release induced by cations and other drugs, such as nicotinic agonists, calcium ionophores, veratridine, scorption venom, and phenethylamines. The final section deals with the biochemical assessment of peripheral adrenergic activity and the clinical pharmacology of adrenergic neuron blocking agents. This book is intended for pharmacologists, neurologists, researchers, and advanced students. IV HOW DOES Ca ENTER THE TERMINALS? V WHAT IS THE ROLE OF CALCIUM IN VESICULAR EXOCYTOSIS? IV EVIDENCE FOR THE PRESYNAPTIC LOCATION OF THE ALPHA-ADRENOCEPTOR INVOLVED IN THE NEGATIVE FEEDBACK MECHANISM THAT REGULATES NORADRENALINE RELEASE DURING NERVE STIMULATION. II IS AMINE EFFLUX CARRIER-MEDIATED? III ARE THERE EXTRAVESICULAR BINDING SITES FOR NORADRENALINE?